Today was my first day back at work after my vacation to Canada. I expected to be really tired due to jetlag. Somehow, I managed go get through the day without any serious problems. The only major issue I had was that I kept writing December 2004 on all of my student files. After a 12+ hour flight from Tokyo, my plane landed in Minneapolis / St. Paul International airport. I got off the plane and then went through another round immigration and security checks, and moving my suitcase from one conveyor belt to another. I still don’t understand the purpose of moving my suitcase from one side of a room to the other. After escaping the security zone, Rob (the Winnipegger who sat next to me on the flight), and I decided to grab some lunch at Pizza Hut. In all of my travel plans I hadn’t considered the need for US currency. At the cash register I asked the Pizza Hut cashier if I could pay with Canadian dollars or Japanese Yen. She thought I was just being a jerk and was not amused. Thankfully my Canadian credit card worked, and I was able to “enjoy” a lunch of extremely greasy pizza. Seriously, after eating Japanese food for over a year I couldn’t believe how greasy the pizza was. Rob and I explored the huge airport together. Just as we were getting ready to go to our gate, I noticed that I no longer had my sister’s extremely heavy ancient laptop. We returned to Pizza Hut and couldn’t find it. Fortunately someone had turned it into security. Unattended bags in an airport are no joke, and I am happy that I wasn’t detained and that the laptop wasn’t exploded or anything. Our departure ended up being delayed by freezing rain, so we got to Winnipeg an hour late. 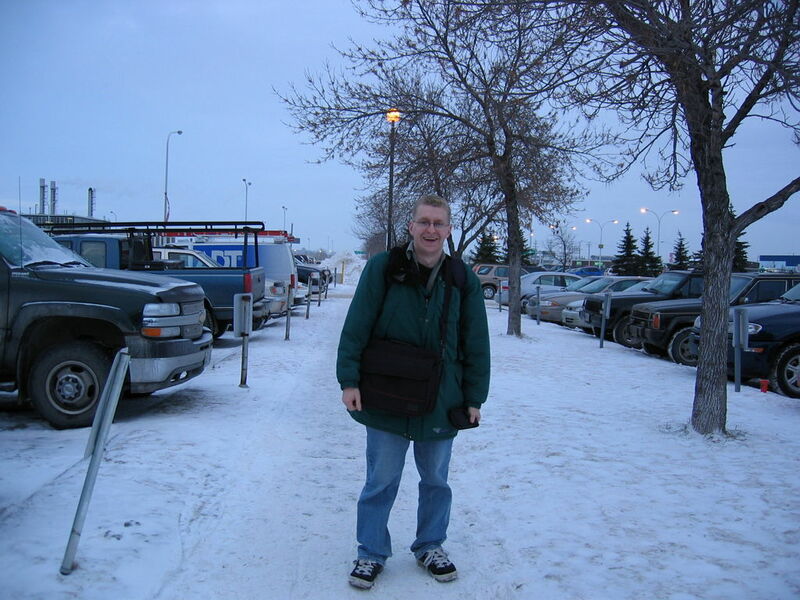 We left Japan at 5:00pm on December 20, and landed in Winnipeg at 4:00pm on December 20, an hour before we left. Yes friends, time travel is possible. After landing in the past, we got sniffed by a police dog, and again went through immigration and customs. Thanks to a 2 litre bottle of shochu, I was over my limit for alcohol. The customs officer had the Christmas spirit, and let me bring my Christmas spirits through without having to pay extra. It was great to see my family again! It had been six months since they left Japan, and I really missed them. On the way out of Winnipeg we stopped at Olive Garden for dinner. I did my best to avoid falling asleep at the table as I stuffed myself with breadsticks, salad and pasta. Since I was no longer used to heavy North American food, the oversauced pasta sat like a brick in my stomach. The ride to Portage la Prairie was a typical, terrible winter drive. The road is flat with no wind breaks, so any amount of wind and snow provides for dangerous conditions with low visibility. I was happy that my dad was driving, and I slept in the back seat. Despite the cold weather, it really is great to be home!